Hope those here in the states had a great holiday weekend. It was a busy weekend with celebrating Memorial Day as well as Shavuot. Thanking God for the blessing of the Holy Spirit our Comforter as well as the blessing of so many men and women who have fought for our freedom and liberties. With the season also comes the wrapping up of the school year which means a lot of graduations! So I am going to share a few projects through out the week here. Let’s get started. Here’s a look at my completed card. The papers are from the DCWV Edumacation Stack. 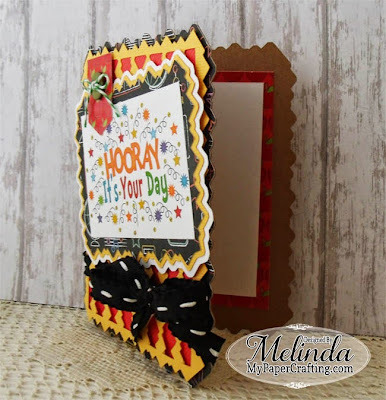 The base is from Kraft cardstock. I started by using the card basics cut file kit from PaperCraftingWorld.com . I cut the base out of the kraft cardstock. I cut the zigzag frame and one of the mats in some golden yellow cardstock. I then cut one of the other mats in white cardstock and then the other in some fun school print paper from the DCWV Edumacation stack papers. 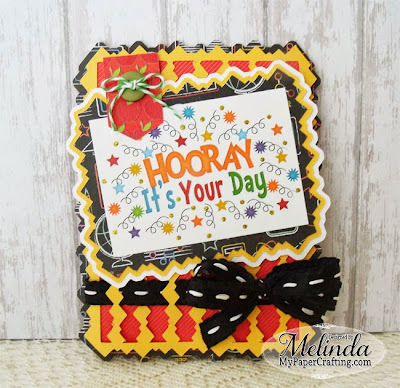 The card base is also covered by that same print and then underneath the zigzag frame I have a piece of diagonal pinstripe red paper from the same Edumacation Stack. 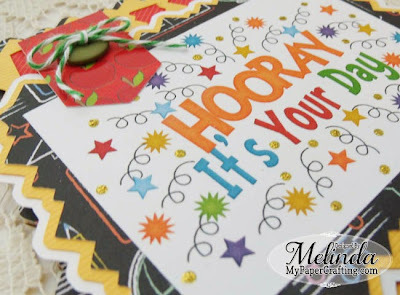 I used the Hooray It’s Your Day Digi Printable from PaperCraftingWorld.com I simply printed it out the finished colored png. I added some Golden Rod Stickles to some of the dots for a little extra, but understated bling. 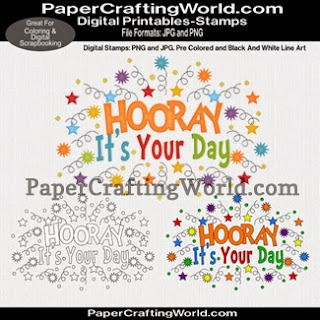 Hooray it’s your day digital printable set. On sale this week. PLUS spend $5 and get an additional 50% off! Card Basics zigzag cut file set. On sale this week too! Here’s a closer look at the little banner with a button and some twine from the Twinery. The apple print paper is also from the DCWV Edumacation Stack. 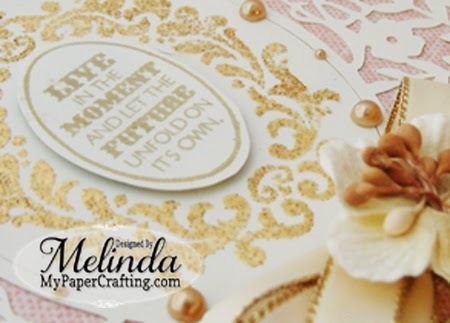 In this shot you can also see some of the gold stickles I used for the dots. Here’s a view of it opened. You can see the edge of the zigzag cut perfectly. 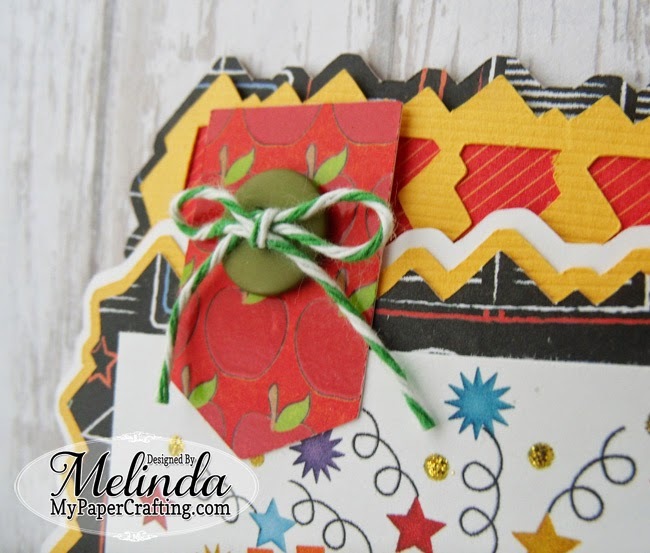 I threaded some ribbon through the zigzag frame and then added a fun bow. Easy peasy! Again, one last look at the finished card. Don’t forget, PaperCraftingWorld.com has several fun graduation celebration files on sale this week. Plus Spend $5 and get an additional 50% when you use code PCW50! A great value. As always, thank you so much for stopping by and sharing your crafty time with me. It is sincerely appreciated as is your kind comments. This is so fun! Love the colors!